Certain metals are essential for human health like iron, zinc, copper, manganese, chromium, molybdenum, selenium, calcium and sodium. Of course, we need these only in trace, or very small amounts. These metals are found naturally in the earth where plants and animals absorb them and then pass them to us as food. Other metals known as heavy or toxic metals are elements that cannot be metabolized by the body and include: mercury, nickel, lead, arsenic, cadmium, aluminum, platinum, and copper (the metallic form found in copper pipes, versus the ionic form required by the body). Exposure to heavy metals has been linked with developmental retardation, various cancers, kidney damage, and even death in cases of very high of exposure. The fact is that we are all being exposed to and absorbing harmful substances to some degree every day. Aluminum powder is found in kitchen pots, toothpaste and underarm deodorant and processed foods. Mercury from amalgam (silver) fillings breaks down and leaks a toxic gas into our brains. And, these are just a few examples. We may not be able to control all the toxic metals we are exposed to, but we can control some. Most people are shocked to find out that metal and chemicals from your kitchen pots and pans can leach into your food, especially under high cooking temperatures. Even a small amount of metal or chemical can affect the taste of your food, not to mention, your health. Want a check for yourself? Put a half a glass of clean water into one of your pots and scrub the bottom with a brand new plastic scouring pad. Scrub for thirty seconds, and then pour the water into the glass. What do you see? Would you drink that water? If the water is cloudy or if the water tastes metallic, you should consider changing your cookware. Acidic and alkaline foods will increase the leaching of metals from your pots into your food. Generally, vinegar and fruits are the most acidic foods and include lemon juice, apples, blueberries, cherries, grapes, grapefruit, peaches, pears, pineapple, plums, and raspberries. The more acidic vegetables include: pimentos, tomatoes, or anything processed with vinegar or acid liquid, such as artichokes or beets from a jar or can. Alkaline or basic foods include eggs, garlic, onion, potatoes, avocados, bananas, spinach, broccoli, carrots, peas, and my favorite, unsweetened chocolate. The body has a much higher tolerance for acid foods than basic foods. That is because acidic foods tend to push the body to a, healthier more alkaline position. 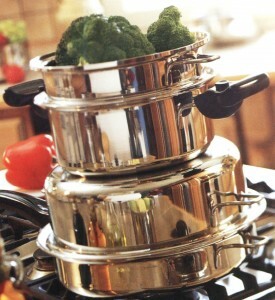 Inexpensive and excellent at transferring heat quickly to food, aluminum has been used for kitchenware for a long time. Aluminum is fairly soft and will release more molecules into the food than harder metals used in other cookware. Alkaline foods will increase the amount of aluminum that leaches into the food. Aluminum cookware is definitely linked to an increasing chance of early onset Alzheimer’s disease. Medical research has shown that approximately 20% of the daily intake of aluminum has been proven to come from cooking utensils (pans, pots, kettles, and trays) made of aluminum. In 1961, “The Happy Pan”, the first US-made Teflon coated frying pan was introduced and became popular because Teflon is used as a non-stick coating. However, while Teflon is stable and nontoxic, it begins to deteriorate after the temperature of cookware reaches about 260 °C; 500 °F, and decomposes above 350 °C; 662 °F. Meat is usually fried between 400 and 450 °F (204 and 232 °C), and most oils will start to smoke, meaning they are turning rancid before a temperature of 500 °F, 260 °C is reached. Empty cookware can easily exceed this temperature upon heating. Overheating of Teflon generates highly toxic fumes and poses a serious health hazard to the human respiratory tract. Heated to its smoking point Teflon fumes are ten times as toxic as phosgene gas, a chemical weapon used in both World Wars. In May, 2003, the environmental research and advocacy organization, Environmental Working Group, filed a brief with the U.S. Consumer Product Safety Commission petitioning for a rule requiring that cookware and heated appliances bearing non-stick coatings carry a label warning of health hazards to people and to birds.Cast iron cookware can leach dietary iron into food which is actually a good thing. People with anemia may benefit from the added iron in the food. However, Cast iron is very heavy, rusts if not handled correctly and not practical for all types of cooking. Stainless steel is the better choice for cookware, but even good stainless, after it has been used and scoured with steel wool pad, or dinged and pitted through years of use, leaches some metals into your food. Stainless steel is actually a mixture of several metals, including chromium, molybdenum and nickel, all of which can trickle into foods. Chromium and molybdenum are needed by the body in very small amounts, but nickel, is a toxic metal known as a carcinogen or cancer causing. We test patients for toxins contributing to health problems using hair. Hair growing out of the body brings its message of what the environment was like inside. Diagnosing a hair element test result, I can usually tell you what kind of pots and pans you are using in your kitchen. Nickel and aluminum are heavy metals we see often in hair toxicity test results. Other metals we test for include lead, tin, arsenic and mercury. The Center for Disease Control acknowledges the value of hair mercury levels as a marker for exposure to neurotoxic methylmercury from fish in mothers and children. We see mercury in all ages also form exposure to dental amalgams, even in children who never had silver fillings, but their parents did. Get The Point! We may not be able to control everything in our environment, but we can control our food choices, our lifestyle and do our part in keeping our body’s environment clean and healthy. If you want to know what toxins are being absorbed into your body and how to detox naturally and safely, visit, call or email so we can arrange a hair analysis test and personal health program for you.